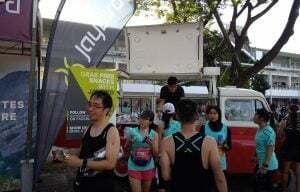 Race Review: 2XU Compression Run 2019 [21.1 Km] (by stargazer) | JustRunLah! 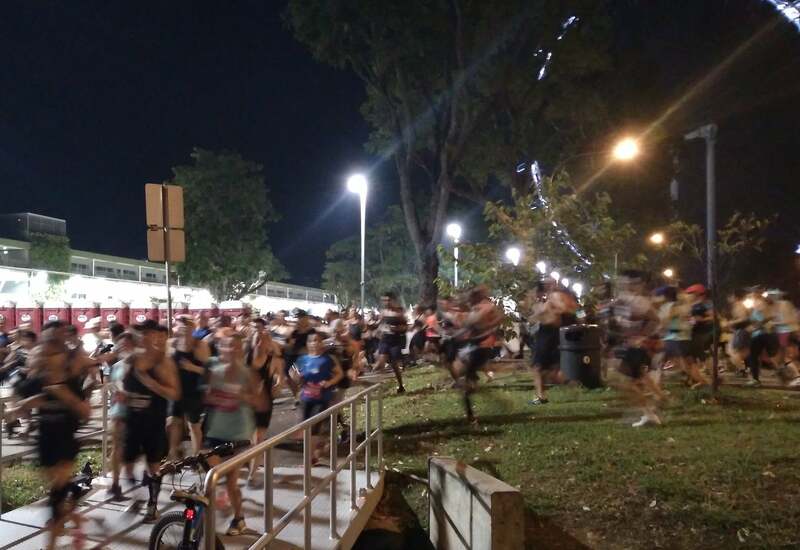 The 2XU Compression Run is one of the more popular race in Singapore. Every year, thousands of runners sign up for this race, especially for the 21.1 km category. I believe many aspire to own a piece of the finisher shirt which the runners rightfully owned after completing the half marathon. Runners’ comments about this race have also been consistently positive. These are the reasons why I participated in this year’s 21.1 km event. 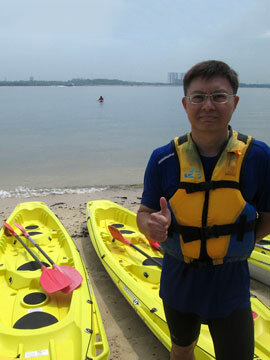 I had a full day of rock climbing session on Saturday before race day Sunday, 7th April. My body was quite sore and I wasn’t confident of completing the race. But this race was important to me because I would be using it to gauge my readiness for the Standard Chartered Full Marathon in Dec. I would normally take the shuttle service for half marathons scheduled in the early mornings. But this time, I decided to take Grab so that I have more flexibility in managing my time and since also I decided not to join the 1st wave of the flag off. I reached the race venue at 4.25 am, just in time to witness the flag off of the 1st wave shortly. Many runners were waiting for subsequent waves and I could clearly see the excitement on their faces, many of whom were taking part together with their friends. Bag deposits were fast and fuss-free within the shelter of the F1 Pit Building. 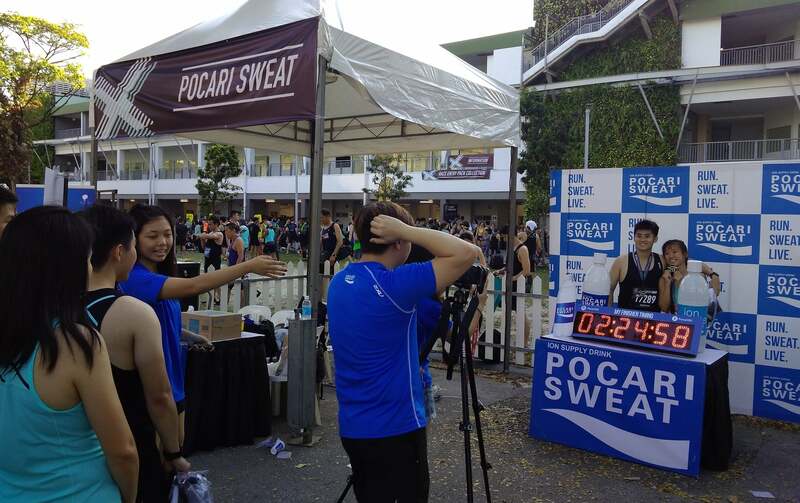 I took some cups of Pocari Sweat for hydration before joining and flagged off in the 5.00 am wave. The start of the run loop the runners back to the car park before u-turning into Republic Boulevard. It was quite a ‘sharp turn’ and there was some resulted congestion. As we continued, we were then led into an underpass where it was near total darkness. I was thinking perhaps some portable lights could be placed here to provide some illumination to decrease the possibility of the runners being tripped. It was a good 20 seconds before emerging from running in the darkness. We headed towards Suntec City before u-turning towards Sports Hub. It was always a joy to run along Nicoll Highway on a closed road. There was ample space for the runners without bumping against each other. 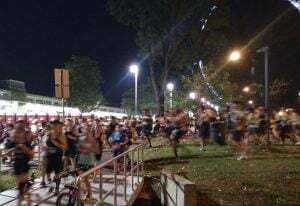 However, I don’t really enjoy running at Sports Hub and along Tanjong Rhu Connector, where the passageway is narrow. In addition, there were parts where the runners have to run on grass patches. Though it was dry weather, perhaps some wooden boards could be placed on the ground for the benefit of the runners? Dawn was breaking as I ran along Marina East Drive and by the time I reached Gardens By The Bay, the sun had risen. I thought this was a ‘perfect plan’, as my pace generally allowed me to appreciate the surrounding scenery and iconic landmarks in the day time. The ‘turnaround’ at The Promontory was a surprise (though no big deal) to me and I believe it was planned in order to make up the 21.1 km distance. In any case, I completed the race at a time of 2:43:18 hr. This was about the same time I achieved at last year’s Real Run. The difference was for this 2XU race, I was feeling much better and not breathless. The only obstacle to overcome to improve my timing is my knee problem. There appeared not many post-run activities. Jaybird was giving out free food, such as oreo and apples. Runners were queuing up to have their photos taken with their respective timings. 1) Although the hydration stations were sufficient, I felt the tables serving out the drinks were not. This resulted in congestion when many runners stopped for replenishment. 2) Could the distance at the ‘turn-around’ at the start and The Promontory be replaced with a longer but smoother run at The Garden By The Bay East? 3) The 2XU race singlet did live up to its claim of being odour free and did dry reasonably fast after the run. 4) I had assumed that for such a popular and large scale event, there would be more post-run activities, such as Zumba or physical exercises. Or were there after I left at 8.30 am? In any case, I felt there was little engagement with the runners and the atmosphere was rather ‘muted’. Perhaps I had come to the race with high expectations and thus now felt a sense of disappointment.